How true! How things and people change over a period of time and keep changing. If I think of myself years ago and now, I can barely recognize myself! As a kid, I would most the of time be in my room, my nose buried in a book. Tinkle, Tintin, Enid Bylton, Nancy Drew, Hardy Boys, then came along Sidney Sheldon, Jeffery Archer, Mills and Boon... When we had guests over, my parents would have to call me out to say hello to them, and then I would promptly disappear back into the room in a flash. Now I have changed, I love company. And am obsessed with cook-books instead of novels. In school, I was the very serious student, pretty good at academics, lazy at sports. Teachers would ask us what we wanted to do when we grew up. Though I loved reading Biology and Chemistry, I hated the sight of blood and the smell of disinfectant, so I was not born to be a doctor. Math was not really my favorite subject, so not an engineer either. These two in those days were the highly recommended and aimed at professions. What I loved was languages. What I really wanted to be was a home-maker...and that was it. But it was hardly the thing you would win applause for from the teacher or class when you said that. I got what was considered as pretty good percentage in my 10th exams. So taking up science as a subject in college was the thing to be done. But unambitious me opted for commerce. My father retired as a Professor in Chemistry, all of us siblings studied in the same college where he taught. My older sister was doing her Bachelors in Science, my younger sis knew from the time she was in Nursery (no kidding!) that she would be a doctor (she is a pathologist with a string of degrees and PGs now!) The Principal of the college (who also happened to be my mother's teacher in college) was not happy with my choice of academic & career route. I was called to his chamber, he wanted to know if I was really really sure that I did not want to be a doctor or an engineer. I mumbled my yes. You see, I was very unambitious. Now, I am extremely ambitious - I want to try to bake everything possible! Ads - you either love them or hate them. Sensible folk normally flip channels when there are ads on television, but I never claimed I am that. Not that I am crazy about buying all the new products that flood the market everyday, in fact, far from it. I watch ads because I like to watch them. Conveying an idea and selling a product within seconds and doing it effectively is such a challenge, particularly in today's world when there is a product deluge. Good, clever ads leave that impact on your mind. Remember the ads we saw as kids?. Like washing powder Nirma with Sangeeta Bijlani, can you forget that song? Videocon Washing machine where the little girl gets ready for her party in minutes in spite of the dog messing up her dress, thanks to the washing machine. Complan has helped Shahid Kapoor and Ayesha Takia grow so tall today - not very surprising since the mother used to get the entire bottle of Complan to the dining table. Vicco Vajradanti which gave Grandpa teeth strong enough to eat sugarcane, the Limca ad which which still makes me feel refreshed when I think of it. The Surf ad with Lalitaji taught us samajhdaari over the sastaa wala powder. Wonder if she still wears that saree... Am sure Lalitaji's grand-kids would be using those still sparkling pair of Ravi's white school shorts. Who can forget the bunch of kids in the hostel eating Hajmola under the bed. Not all ads got the entire nation to use Nirma or Vicco Vajradanti, Clearasil did not 'erase' my pimples completely for years, but the point is ads have quite a lot of us SOLD. That's marketing for you. Ads today transform a dusky girl into a fair one and hence automatically beautiful and successful too. Cheerfully eating a cereal twice a day - ad nauseaum -will help you lose a whole lot of weight (no wonder) right in time for your friend's wedding. Talking about selling food and eatables, those which come with a 'healthy' tag to them at that is something of interest. Don't our kids pester us to buy that outrageously priced sweet treat with a 'surprise' in it as it contains 'healthy milk'? Artificial sweeteners make your dessert 'healthy', the fat and other calories conveniently forgotten. The 'zero-cholesterol' snack which has no business having fat in it at all, the 'baked, not fried' wafers which have a good lot of shortening in them? The instant soup mix with a tiny bit of dehydrated veggies in them become 'wholesome' and the 'heart friendly' oil is reason good enough to have the dining table creaking under the weight of samosas and kachoris. Forgive me for sounding like a phophesizing nutritionist but am sure you will agree, 'Zero trans-fat' wafers have saturated or unsaturated fat in them. Chocolate flavored, 'vitamin packed' cereal and the multi-grain noodles may be relatively healthy, but not really healthy and wholesome. 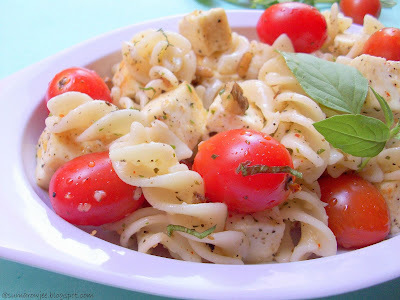 Noodles, cookies, breads etc which claim to be whole grain certainly have whole grain in them, but not to a great extent. These life savers need to be on our shelves but we could buy these less often? Truth is we can't do away with these and they have to be prepared with fat, so aren't home-made ones infinitely better, if not infinitely healthy, if we can actually use a good amount of whole grain in them? Less fat and with us being in control of what goes into it? In custom flavors, made with care, the added bonus of satisfaction and knowledge that this is a lot better than the store bought stuff? 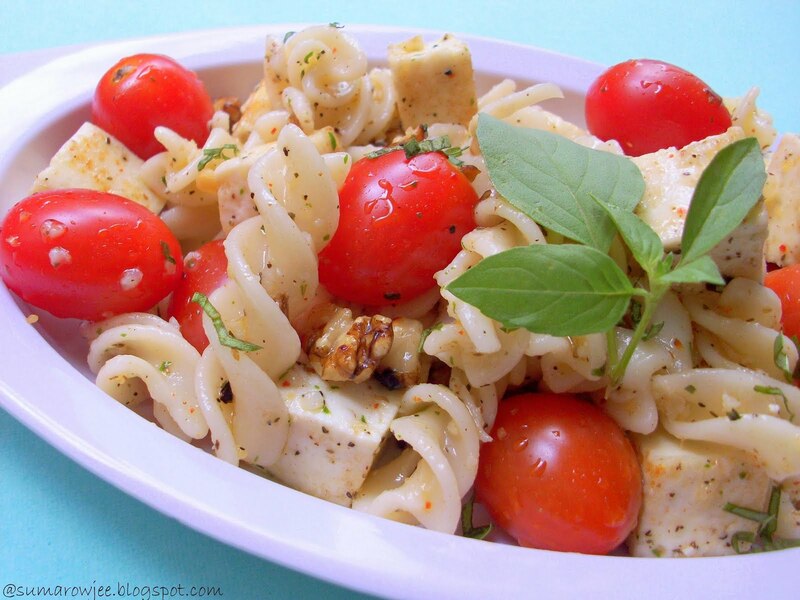 We certainly can't start manufacturing our own noodles and wafers, but healthier cooking is certainly a good step in this direction. I completely agree that baking for one, doesn't sound all that exciting and as enchanting as it does with APF, but yes, we could limit the use of APF and the frequency with which we use and consume it. The King Arthur Flour Whole Grain Baking book gives me hope that this could be possible. 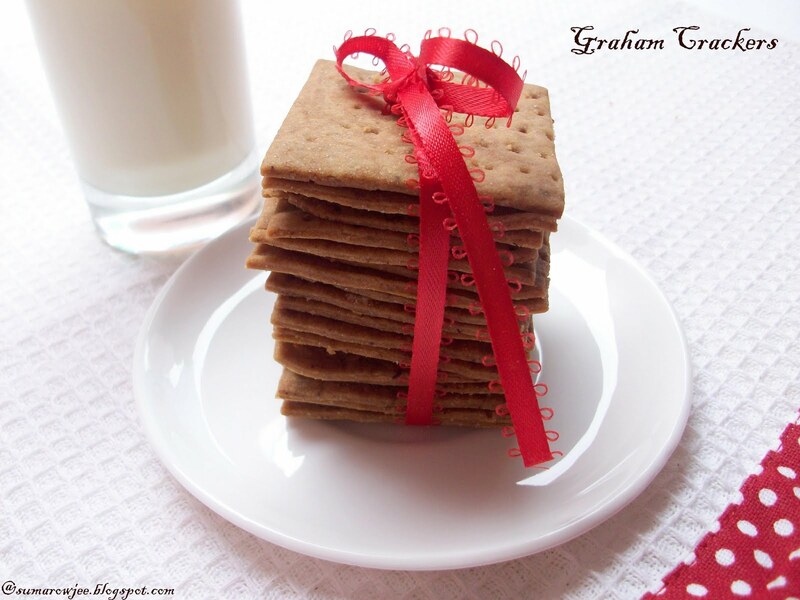 The light, crisp, just-about-sweet and tasty Graham Crackers testimony to this. Vanilla beans, vanilla extract, vanilla sugar, vanilla bean sugar. For someone who had never used a vanilla bean until recently, I am now someone who is going into panic mode as and when I use up a bean from my jar. Oh joy! I am now discovering how amazing these can be when used in cakes and desserts. These tiny tiny seeds offer so much of flavor and aroma, it just doesn’t cease to impress me. Not just the extract which makes a good 180 ml bottle full with just 3 or 4 beans, the vanilla pod can be reused for making vanilla sugar and vanilla bean sugar again. After the seeds are scraped out, the pod still has tons of flavor in it. So don’t ever throw away the pods after use. You could put the washed and dried pods in a jar of granulated sugar and allow the aroma to be gradually infused into the sugar. As and when the sugar is used up, you could top up with more. 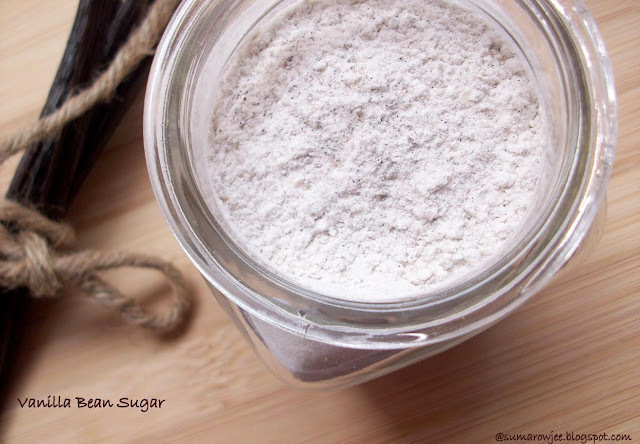 Use this in place of regular sugar in any bake or as a crunchy topping over cakes, sweet breads, cookies or just about anything. 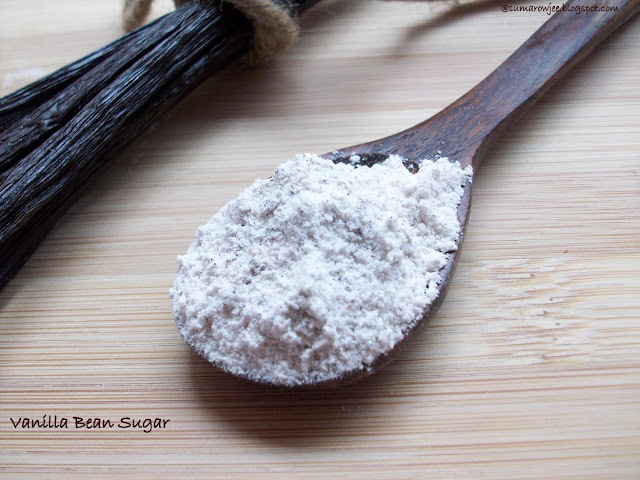 You could make Vanilla Bean Sugar which is vanilla pods ground fine in a food processor along with granulated sugar (regular or caster). You get the aroma of vanilla in the processed sugar which can be used in place of ordinary powdered sugar on top of your waffles, pancakes or French toast. Doesn’t take much to up the gourmet factor in a ridiculously simple way, does it? Now that we know the magic of vanilla, could we just not use more of the extract in a baked product to heighten the effect? No. Too much of extract will make your cake or cookie or scones taste bitter. 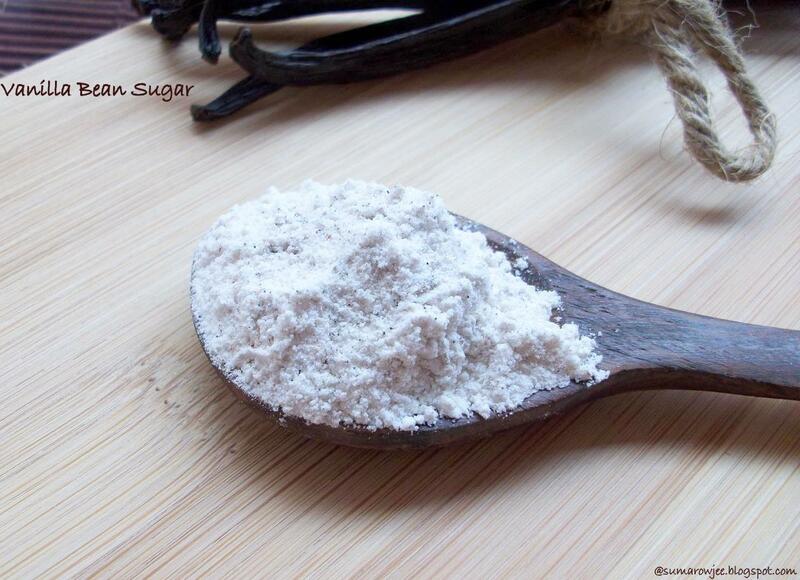 Conversely, adding vanilla beans, just enough extract and sugar will give more of the vanilla taste and aroma without making it bitter. Isn’t that reason enough to make your vanilla sugar and vanilla bean sugar and stock up on good quality vanilla beans? Here is how you make your vanilla bean sugar. Reference from multiple sources, including Baking 911.com Nachiketa and Shaheen. Using scissors, cut the pods into small pieces. Process the beans along with some of the sugar until very fine. Sieve. Use any bits again while grinding the next batch of sugar. Mix everything well till you have an uniform mixture. I seem to have taken the scraping the seeds out bit a tad too seriously while using the bean, so my beans did not have a whole lot of seeds left. If yours do and if the seeds clump, rub the clumped bits between your fingers with some of the powdered sugar. This will help them get distributed evenly. Store in an airtight container. 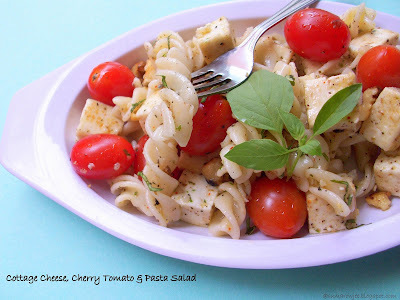 Put this in a jar on your dining table! Fast!! No. No mistake here about the title of the post. I mean its not supposed to be Floating Curry Leaves In Lentils or something like that. Its goes by the name you see here. It was just badly salivating me in a real real hurry to click the pics before I ate and ran out for a crazy day of shopping. Though this does look like it was taken right on my dining table in the midst of a meal (sheepish) it really was not. Forgive me again for the pics, but I had to tell you about this Huli or sambar which tastes real real good. 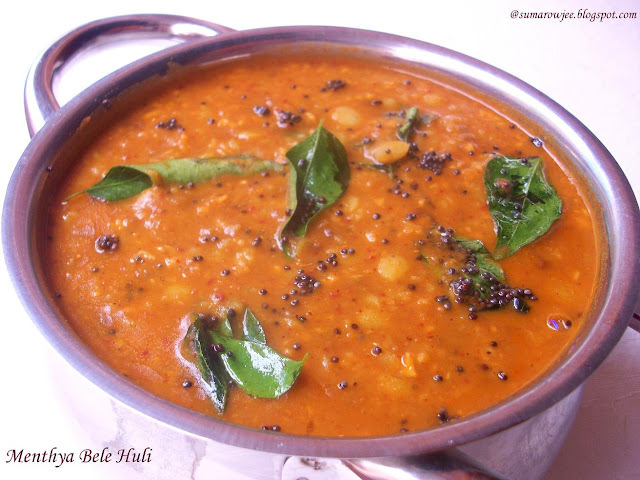 Its called Menthya Bele Huli, meaning Fenugreek and Lentils Sambar. I had in fact not really heard of or tasted this huli till I got married. I got married into a family who have been entrepreneurs since the past 3 generations - something not all that common in our community. We are more the get your education, find a job community. I was not really ready for the implications of marrying into an entrepreneurial set up. I would not have really taken much notice of it if it did not have a direct impact on where it matters a LOT to me. You guessed it. Food!!! Not the food per se, but the erratic work timings and the consequent time at which we ate our meals. I was and am used to eating food pretty early and on time with my father being a lecturer in college, fixed working hours etc. My parents made special effort to ensure I had my meals never got delayed. At the cost of being repetitive and boring, nothing irritates me more than being on an empty stomach for long. To cut the story short, we were just married and at in-laws place in our home town. Father-in-law owns a home appliances store. Hubby is an entrepreneur too, though in a very different set up. He would go with my father-in-law to the store every morning. No complaints (yep, am lying through my teeth:-)), but what really rubbed salt into the wounds was he would EAT and go!!!. But of course I was too new to ask when I would get to eat. By the time I would eat with my mother-in-law and sister-in-law a little later, I would be ready to eat a horse! Pacing around with a grumpy face, allowing my loudly growling tummy to be heard over the din of the wedding household, would hardly make me the best new congenial daughter-in-law . Smile, be pleasant with the rest of the new clan - on a wildly rumbling stomach!. Ears perpetually strained for the sound of metal on wood. At last! heard it - ah Music!! No utensils and ladles actually, clinks and clanks. Hurray!! But hey, remember, I am a new bride. No running to the table. Wait to be called. Wait till all the plates and all the dishes are served. Then wait politely for the others to start. Then eat as pleasantly and as slowly fast (fast but slow enough) as good table manners permit. Second servings - fine, but a third - will they think they have got a glutton for a DIL (which I am not if I eat on time)? Tough job man!! One such day, hungry me was at the table with mother-in-law and sister-in-law. Waiting for the meal, trying hard not to sniff the aroma laden air too loud. The menu on that day included Methya Bele Huli. ????. Well....ahem... Mother-in-law informed that this is a family favorite. I could see fenugreek seeds here and there, in fact, plenty of them in the sambar. So many bitter fenugreek seeds in an otherwise perfectly good and tasty huli? What on earth!!! It was not bitter by any means, but I kept fishing out the seeds trying not to make it too conspicuous. I ate it, though I did not relish it hugely. Since then, I have eaten this dish innumerable times in the past dozen years of marriage and now its one of my favorites too! Supposedly made in the Madhwa Mutts for the evening meal, this particular huli has no vegetables in it, only a generous amount of methi seeds and the rest of the ingredients which go into a sambar. Its definitely not bitter. Extremely aromatic and very tasty, it makes a fabulous accompaniment to rice, particularly on days you run out of veggies. Aralu sandige (kind of deep-fried crisps) and hot oil are ideal to go with this huli. Its confession time again. First thing - a blogger's block. Second - (ouch! it hurts to write this, but its only you, so will cry away on your shoulders) I sometimes just don't get things right when I bake, I really don't know why! And this happens with a series of bakes, I remember this had happened last year too. It will be OK tasting and not really bad, but nothing I can really rave about or share with you. That something will be missing in the recipe, I would not have got it the way it should turn out or its not to my satisfaction. I will be like a grumpy bear and hubby and kids sense that all's not hunky dory in my baking life. I am scared of the way baking is possessing me. I swear during these times that I will never go near the oven again... till the next day. Does this happen to you too or is it just with me? (panic, panic!!!) Do I have to name this as Suma Syndrome? I hope not!!! I am seriously considering a section here titled 'Oops'! May be you can help me with my fiasco? How not to have too many kick-myself moments. Or just so that you can avoid the goof ups I did. Isn't a blog the best way to learn and interact with people who can really understand how serious a matter food and baking is? Oh, yes, am really glad I started to blog! Nothing really binds people like food. Who better a foodie's friend than another foodie? One girl who really is crazy about baking Nachiketa, manages to bake in the midst of her super hectic busy life. Baking late in the night when she comes back from office, doesn't bat an eyelid if it has to be for say a couple of hundred people! Gulp!!! How on earth would she be managing that feat?? Well, I never really have met this baking obsessed friend till date. But then the smell of vanilla travels far. And then there is FB, email and the blog of course which make the world even smaller. Brownies remind me of her somehow. Don't ask me why. I guess I subconsciously think she has a stash of brownies in her bag and in her goodie box at home too, always!! And don't be shocked, but I haven't really made a lot of brownies. I have made a few and am really loving them. Am discovering that I like brownies with melted chocolate better than those made with cocoa. And brownies made with both cocoa and melted chocolate make them taste intensely chocolate. Just the way I love my brownies. Fudgy and very very chocolaty. 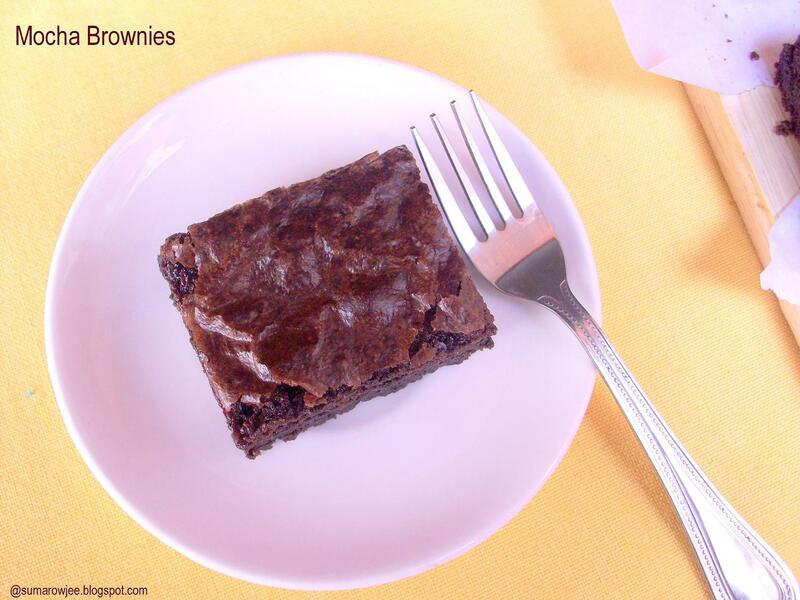 These brownies on Nachiketa's blog looked just that. And when I got a chance to bake 'anything chocolate' at short notice, it just had to be these Mocha Brownies!